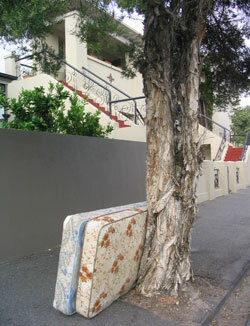 Two more mattresses, this time in Carlisle St, J gets stuck on the past lives stuff again.. Love, pain, birth death, dreams, nightmares, if only a mattress could talk. They are single beds, she starts thinking about child abuse – J is glad they are mute. She gets a text message from P.
Mtress alert Balaclava Stn. The camera batteries are flat. She’ll have to miss this one.